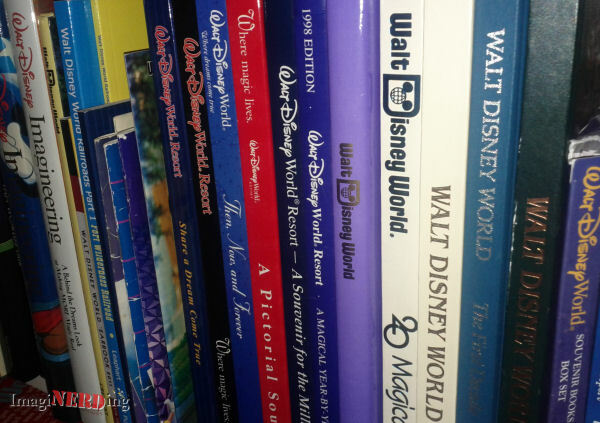 Collecting Walt Disney World books can be a very pricey habit. I’ve been collecting Walt Disney World books since 1994. My current count of Disney-related and theme park titles puts me at 1000 books. I field a lot of questions about books specific to Walt Disney World history, especially books that discuss the Vacation Kingdom of the World (I usually recommend Jeff Kurtti’s Since the World Began and David Koenig’s Realityland since there isn’t one book that does it all). Unfortunately, there isn’t one book that covers Walt Disney World history completely. There are several titles you can digest that will give you a very good picture. There are a lot of titles available and they come from different sources; check out the ones that look most interesting. Most of us have written papers in high school or college that required a bibliography, which is usually a lists of sources cited in the paper. You can also have a list of books about a subject that stands alone. This bibliography is by no means a complete list of books available on Walt Disney World; I have only added books that I own and have read. Feel free to leave a comment if I have missed something good! 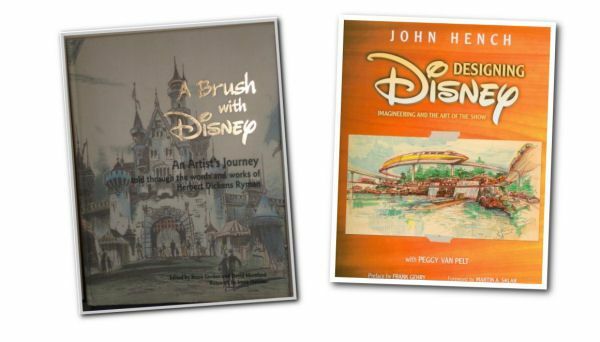 The books included in this set focus on more than just Walt Disney World. They look at the people behind the parks and the company. I consider each title an essential part of any Disney enthusiast’s library. Finch, Christopher. The Art of Walt Disney: From Mickey Mouse to the Magic Kingdoms and Beyond. 2011 (many different editions). A complete look at the history of the Disney Company with a few chapters dedicated to the theme parks. Not groundbreaking but looks at all of the Disney parks. The Imagineers. Walt Disney Imagineering: A Behind-the-Dreams Look at Making the Magic Real. 1998. A spectacular title that looks at how the Imagineers create the theme parks. Concept art, anecdotes and pictures fill the volume. Has information on the development of attractions, lands and resorts. A must have! You can read my review here. The Imagineers. Walt Disney Imagineering: A Behind the Dreams Look at Making More Magic Real. 2010. A completely re-vamped update to the 1998 classic. Shares concept art, photos and paintings from Disney Parks around the world. The focus is mainly on developments of the past 15 years. You can read my review here. Kurtti, Jeff. Walt Disney’s Imagineering Legends and the Genesis of the Disney Theme Park. 2008. Kurtti looks at Imagineering’s (WED) heavy hitters and discusses their contribution to the modern theme park. Rare concept artwork and loads of biographical anecdotes present a look at early Imagineering. You can read my review here. Smith, Dave. Disney A to Z: The Official Encyclopedia. 2006. Smith has created the encyclopedic work that should be on everyone’s shelf. Covers all of Disney and it’s a great resource for attraction, restaurant and shop openings and closings. Smith, Dave. Disney: The First 100 Years. 1999. An essential part of every collection, Disney Archives Head Smith has put together a chronological look at the Disney Company. The following titles are specific to Walt Disney World and cover more than just an attraction. The Kurtti, Koenig and Beard titles are a must! 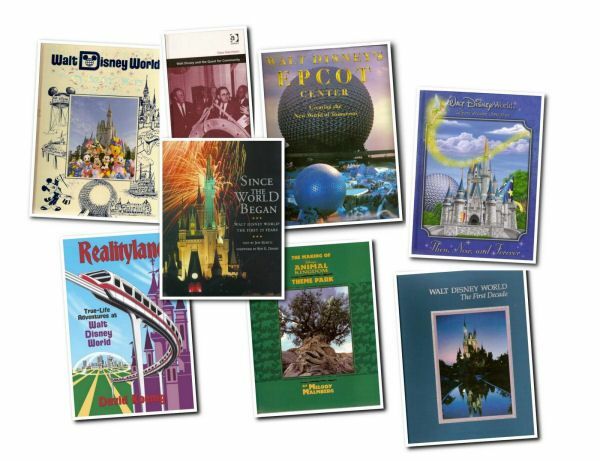 If you are interested in the history and construction of Walt Disney World, check out these Walt Disney World books. Beard, Richard F. Walt Disney’s Epcot Center: Creating the New World of Tomorrow. 1982. This is the book that every fan of Epcot should own. An amazing amount of conceptual artwork and photos of the park during its first few months. In-depth information on the pavilions and anecdotes from the Imagineers. There are three editions: a pre-opening, post-opening and a short version. The difference in the post- and pre- is whether some of the pictures are in-park photos or close-ups of models and the title. You can read my review here. Emerson, Chad. Four Decades of Magic: Celebrating the First Forty Years of Disney World. 2011. 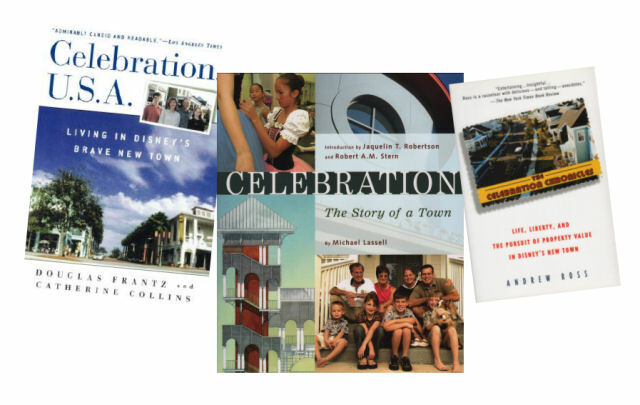 A compilation of essays celebrating the rich tapestry of Walt Disney World by Disney historians, bloggers and enthusiasts. Includes an essay by yours truly! Emerson, Chad. Project Future: The Inside Story Behind the Creation of Disney World. 2009. Emerson takes an in-depth and straightforward look at the creation of Walt Disney World. It covers the purchase of the land and the political machinations that took place. It includes a great timeline and listing of key players. You can read my review here. Foglesong, Richard. Married to the Mouse: Walt Disney World and Orlando. 2003. A critical look at the relationship between Walt Disney World and its Central Florida neighbors. The title recounts a lot of the deals that were made to bring the Mouse to Florida and the relationships that developed. After reading this, you might question the good that Disney does. Still, it is a compelling read. Gennawey, Sam. Walt and the Promise of Progress City. 2011. An urban planner by trade, Sam is uniquely qualified to trace the development of EPCOT Center. This books looks at how Walt evolved his plans and what EPCOT Center might have looked like if plans had progressed. You can read my review here. Gordon, Bruce; Kurtti, Jeff. Walt Disney World Then, Now, and Forever. 2008. Theme Park Exclusive. Gordon and Kurtti have written a history/souvenir guide for Walt Disney World. It does act more like a family scrapbook than a history book, until you delve into its pages It is one of the few books to talk about attractions past. You can read my review here. Koenig, David. Realityland: True-Life Adventures at Walt Disney World. 2007. Koenig looks at the creation, construction and development of Walt Disney World. There is not another title that talks to as many former employees to reveal anecdotes and what happened politically. You can read my review here. Kurtti, Jeff. Since The World Began: Walt Disney World, The First 25 Years. 1996. The seminal title in any theme park enthusiast’s library. Kurtti explores the first 25 years of Walt Disney World with photographs and rich historical detail. This is the only official history book about the Florida property. You can read my review here. Lange, Jeff and Yee, Kevin. EPCOT: the First Thirty Years, a Retrospective. 2012. The 500 images alone are worth the price of admission. Add Lange and Yee, two noted historians, and you have a book made for Epcot fans. Malmberg, Melody. The Making Of Disney’s Animal Kingdom Theme Park. 1998. This book goes into an incredible amount of detail on the initial ideas, design and implementation of Disney’s Animal Kingdom. You can read my review here. Mannheim, Steven.Walt Disney and the Quest for Community. 2003. This book could almost be considered a biography of the Epcot that could have been. Mannheim writes a very through-provoking and enjoyable work on Walt Disney’s plans for EPCOT Center and how they germinated and became reality (or didn’t, in some cases). You can read my review here. Snyder, Chuck. Windows on Main Street: Discover the Real Stories of the Talented People on the Windows of Main Street, USA. 2009. A 26-page book that looks at tje key players that helped build the Magic Kingdom and Disneyland. contains a great map and index to every window pre-2009. Not every window if featured. The Story of Walt Disney World, Commemorative Edition. Various Years (1971, 1973, 1976). An official publication that looks at the first few years of Walt Disney World. It focuses on the building of the Magic Kingdom, the resorts and the rest of the vacation kingdom. It has a great stylized map and lots of pictures. It has some great construction and behind-the-scenes photos. Walt Disney World, The First Decade.1982. An official publication that looks at the development of the Magic Kingdom, hotels and the Village Marketplace. The book is like a time capsule with lots of great photos. You can read my review here. Walt Disney World, 20 Magical Years. 1991. An official publication that is part history and part souvenir guide. Great for pictures and as a time capsule. Updates Walt Disney World, The First Decade. You can read my review here. Yee, Kevin. Unofficial Walt Disney World ‘Earbook 2011: One Fan’s Review in Pictures. 2011. Kevin has been producing this year-long look at Walt Disney World since 2010. This is a great resource for historians and fans. I just wish Kevin had started this series in 1971. You can read my review here. Yee, Kevin, Walt Disney World Hidden History: Remnants of Former Attractions and Other Tributes. 2010. An unofficial guide that looks at the hidden details, histories and tributes throughout the Walt Disney World Resort. You can read my review here. 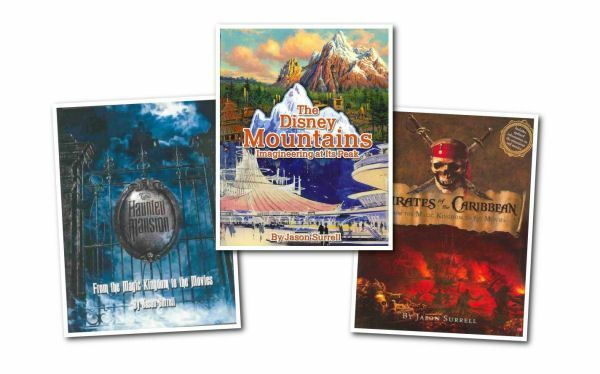 These Walt Disney World books are dedicated to specific attractions at Walt Disney World (and other parks, as well). If you have a favorite attraction that is featured in the book, then you need to track a copy or two down. Brandon, Pam. Marking the Millennium: the Celebration of a Lifetime at the Walt Disney World Resort. 1999. A look at the development, creation and implementation of the Millennium Celebration at Epcot. Interesting to see Disney promote a celebration this way. A must-have for Epcot fans. Broggie, Michael. Walt Disney’s Railroad Story: The Small-Scale Fascination That Led to a Full-Scale Kingdom. 1998. Broggie presents a fascinating look at Walt’s Railroad–part biography and part theme park history. The majority of the book focuses on the Carolwood-Pacific, but Broggie does discuss the Magic Kingdom and Ft. Wilderness Railroads. You can read my review here. Three books created to help publicize the related Future World pavilions and educate children about the history and future of the technologies. There are some interesting photos and information from the pavilions. Expedition Everest: Legend of the Forbidden Mountain, the Journey Begins. 2006. A collector’s edition that looks at the development of the Animal Kingdom coaster. Lots of concept art and background information. Jacobs, David. Disney’s America On Parade – A History Of The U.S.A. In A Dazzling Fun-filled Pageant. 1975. It is hard to believe that Disney released a book that focuses solely on a parade! This is a wonderful mix of history, concept art and photographs of the long-running and well-loved parade at Disneyland and Walt Disney World during the country’s bicentennial. You can read my review here. Leaphart, David. Walt Disney World Railroads Part 1: Fort Wilderness Railroad. 2010. David has compiled an monumental and magnificent look at the Fort Wilderness Railroad. A must for any fan of Fort Wilderness, trains or early Walt Disney World anecdotes. Visit the author’s website for more information. You can read my review here. Leaphart, David. Walt Disney World Railroads Part 1: Fort Wilderness Railroad Gallery Companion. 2010. A companion guide to David’s work on the Fort Wilderness Railroad. More pictures than you can shake a stick at! Surrell, Jason. The Disney Mountains: Imagineering At Its Peak. 2007. Surrell takes an in-depth look at every Disney mountain, from Matterhon to Everest, with side trips to some un-built mountains. A must-have for fans of the Disney roller coasters. Surrell, Jason. The Haunted Mansion: From the Magic Kingdom to the Movies. 2006. If you are a fan of the Haunted Mansion, you need to own this book. Surrell starts at the earliest concepts and takes us through to the final incarnations, step-by-step. The concept art is wonderful. We also get a look at all of the different Mansions throughout the different Magic Kingdoms. Surrell, Jason. Pirates of the Caribbean: From the Magic Kingdom to the Movies. 2006. An in-depth history of Pirates of the Caribbean, from concept stages to Disneyland Paris. We experience all versions of the attraction through the script, artwork and photographs. There would be no Walt Disney World without these artists. The Kurtti/Gordon book offers wonderful concept art. Handke, Danny; Hunt, Vanessa. The Poster Art of Disney Parks. 2012. A long time coming, this gorgeous books shares the amazing posters created for Disney attractions. A great look at some past attractions through posters. Hench, John. Designing Disney. 2009. Hench shares his thoughts on helping to design every Disney theme park. The text is insightful and the artwork is astounding. Hench was the master designer of EPCOT Center and most of Walt Disney World.There is also a 2003 edition. Kurrti, Jeff; Gordon, Bruce. The Art of Walt Disney World. 2009. Theme Park Exclusive. Jeff and Bruce have collaborated again to create a sister volume to the wonderful Art of Disneyland. This large-scale book presents concept artwork from every phase of Walt Disney World’s history. Many of the images are seen here for the first time. Every fan of Walt Disney World should own this title. You can read my full review here. Mumford, Dave; Gordon, Bruce. A Brush with Disney : An Artist’s Journey, Told through the words and works of Herbert Dickens Ryman. 2000. A look at Herb Ryman’s art–not just work done for Disney, but over his entire career. There are some amazing concept paintings of the Magic Kingdom. You can read my full review here. Detailed-inspired travel guides, academic treatises and amazing photographic titles. Usually more of a time-capsule than a history title. There are some fantastic Walt Disney World books in this section. Some of them are geared more towards the serious student of Walt Disney World history and some offer images that will please anyone. Brandon, Pam. One Day at Disney. 1999. Tracing 24 hours at the Disney parks all over the world, this photographic journey takes us into the parks, resorts and behind-the-scenes with some fantastic photos. Burns-Clair, Pam; Peri, Don. Walt Disney’s First Lady of Imagineering Harriet Burns. 2010. Harriet’s daughter Pam and Disney Historian Don Peri craft a fascinating and beautiful collection of anecdotes and tributes to Harriet Burns, as told by her family, friends and co-workers. You can read my review here. Childs, Valerie. The Magic of Disneyland and Walt Disney World. 1979. This work is mainly a pictorial essay about Disneyland and Walt Disney World. Geared mainly for park detectives and people who visited the parks in the 1970s. You can read my review here. Crump, Rolly; Heimbuch, Jeff. It’s Kind of a Cute Story. 2012. Rolly had a hand in most Disneyland attractions from the 1960s. He worked on the Florida project, as well, and shares what it was like working directly with Walt. It’s a gorgeous book that is a must-have and one of the best books of 2012. Dunlop, Beth. Building a Dream: The Art of Disney Architecture. 2011. An update of her 1996 work, Building a Dream looks at Disney architecture through the years. The focus is heavy on the Eisner years. The 2011 update does cover a lot of the more recent buildings. There are some great photos of the Team Disney and other administrative buildings. Fjelmman, Stephen J. Vinyl Leaves: Walt Disney World And America. 1992. Vinyl Leaves is a rare book in the fact that it takes a detailed look at Walt Disney World from 1988-1992 and details almost every attraction. It is presented as a sociological/anthropological look at Disney and America, but the descriptions of the parks are the strongest points. The index is astounding and will be referenced for years to come. You can read my review here. Gurr, Bob. Design: Just for Fun. 2012. If it’s on wheels at Disneyland, then Bob Gurr probably designed it. He also had a lot of projects, built and unbuilt, at Walt Disney World. A fantastic look at the design process and what it took to get Disneyland off the ground. Hannaford, Dee. The Gardens of Walt Disney World Resort. 1988. One of the most beautiful coffee-table books ever produced about Walt Disney World. Amazing photographs of the gardens and natural areas help to create a snapshot of Walt Disney World Resort in 1988. Absolutely gorgeous and belongs in every collection. Imagineering Field Guide Series: Epcot, Animal Kingdom, Magic Kingdomand Disney’s Hollywood Studios. 2005-2009. 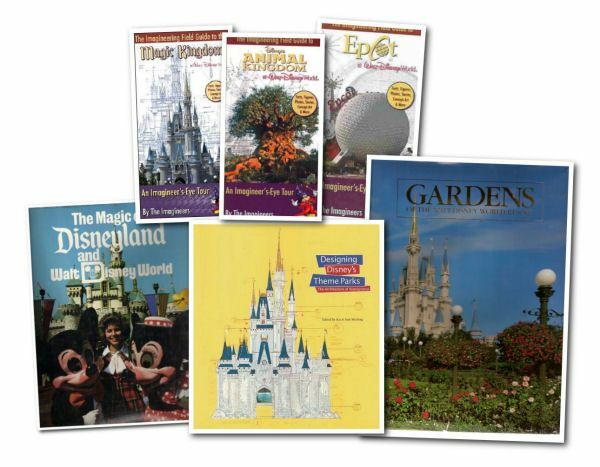 Written by The Imagineers (Alex Wright is the main author), this series of guidebooks discusses some of the details and histories of the parks. They are designed to be taken into the park with you; hence the artwork can be fairly small, but exciting. It is like touring the park with your own Imagineer. Justice, Bill. Justice for Disney: Animator, Director, Imagineer. 1992. Bill was a pivotal person in the development of animatronics and a few early Walt Disney World attractions. It is a very charming memoir and offers something for everyone. You can read my review here. Korkis, Jim. The Vault of Walt. 2010. Jim Korkis coined the term Disney Historian and is an excellent story teller. The stories he shares in this book cover more than Walt Disney World, but there are some fantastic gems. Lindquist, Jack. In Service to the Mouse: My Unexpected Journey to Becoming Disneyland’s First President. 2010. Jack was a pivotal Disneyland employee and was eventually the first president of Disneyland. He worked with the opening of Walt Disney World and was on the World Showcase development team. You can read my review here. Markey, Kevin. Around the World with Disney. 2005. Largely a photo-based souvenir guide, this book does a great job of sharing images from all of the parks, especially comparing the attractions. Marling, Karal Ann. Designing Disney’s Theme Parks: The Architecture of Reassurance. 1998. Marling presents a series of academic articles written by historians, critics and architects that look at the development of the Disney theme park. Wonderful photographs. Preskit, Denise. Christmas at Walt Disney World: An Unofficial Pictorial of the Christmas Season Through the Years at the Parks and Resorts. 2011. Who doesn’t love Walt Disney World at Christmas? Prolific blogger and photographer, Denise chronicles some of the Christmases past and offers a detailed look at the 2011 Holiday season. You can read my review here. Reynolds, Robert R. Roller Coasters, Flumes and Flying Saucers: the Story of Ed Morgan and Karl Bacon, Ride Inventors of the Modern Amusement Parks. 1999. Reynolds presents a narrative series of interviews with the founders of Arrow Development. Mostly about Disneyland, but there is a chapter on Walt Disney World. You can read my review here. Ridgway, Charles. Spinning Disney’s World: Memories of a Magic Kingdom Press Agent. 2007. Mr. Ridgway recounts his years with the Walt Disney Company and what it was like to work at Disneyland and Walt Disney World. It reads like a love letter to the theme parks. Schneider, Ron, From Dreamer to Dreamfinder: a Life and Lessons Learned in 40 Years Behind the Name Tag. 2012. Ron is an incredible storyteller and he recounts his years in and out of the Disney parks. Dreamfinder fans will cherish this. Yee, Kevin. 101 Things You Never Knew About Walt Disney World: An Unauthorized Look at Tributes, Little Touches, And Inside Jokes. 2006. Yee shares a lot of the hidden details of Walt Disney World. A short and fun read for fans. Although Disney has divested themselves of Celebration for most intents, it is still an important part of the Walt Disney World story. These titles look more at the after effect of Disney’s town and less on Walt’s vision. Frantz, Douglas; Collins, Catherine, Celebration, U.S.A.: Living in Disney’s Brave New Town. 1999. I haven’t read this title, but the reviews seem to paint it as a fairly unbiased but not very deep look at Celebration. Lassell, Micheal. Celebration – The Story of a Town. 2004. A glossy, photo-filled look at Celebration near the end of its first decade. Lassell doesn’t shirk the darker times in Celebration’s history but he still paints a picture of a town trying to find itself inside of Disney’s shadow. The book has some fantastic photos. Ross, Andrew, The Celebration Chronicles: Life, Liberty, and the Pursuit of Property Value in Disney’s New Town. 2000.I haven’t read this title. The reviews discuss an academic look at the town that gets fairly favorable reviews. Food is a huge part of the Disney Parks experience. Dining at Walt Disney World has changed considerably over the past 40 years. The following cookbooks are a great way to see what was being served at various restaurants over the years. Brandon, Pam. Chef Mickey: Treasures from the Vault & Delicious New Favorites. 2010. An updated release that mixes new and historical recipes. There are some great photos, too. Brandon, Pam. Cooking with Mickey and the Disney Chefs. 2004. Mostly modern recipes, but there are a lot of favorites from all Disney parks. Brandon, Pam. Delicious Disney. 2006. More recent recipes from Disney parks and the Disney Cruise Line. Chapman, Dorothy. Thought You’d Never Ask (Part I and Part II). 1979 and 1983. One of the first compilations of recipes from Walt Disney World and local Orlando restaurants. This could surprise you with what was actually being served and what was considered haute couture dining. You can read my review of Part II here. Cooking with Mickey: Walt Disney World’s Most Requested Recipes (Volume I and Volume II). 1986 & 2000. Another look at Disney recipes. Not as much flash as some of the newer books, but it has a lot of recipes from restaurants that are no longer or have changed substantially. This is by no means a complete list. There are a few titles I have left out simply because I don’t own them. Are there any that I should include on the list? 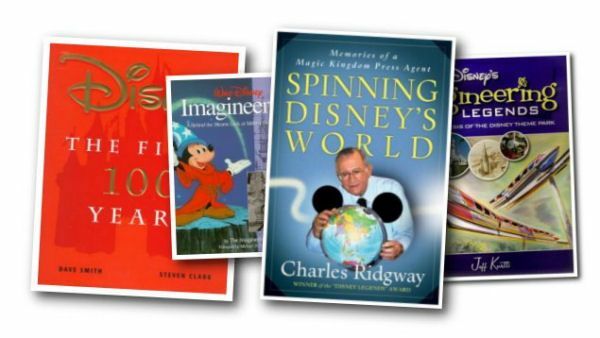 Do you have any favorite Walt Disney World books or one that you always recommend? Do you have a copy of Building a Better Mouse? If not, I’ll be happy to send you one. The 30th anniversary edition has some photos, too. I love Disney. With over three hundred Disney books I have most, but not all of the books listed. For those interested in Disney history I recommend the Official and Unofficial Guides to Walt Disney World to track the year to year changes. I also use the park maps (I have most of the maps and times guides going back to the beginning of the parks) as well as my video collection. I have over 8000 hours of Disney parks videos that I have made over numerous visits. Much of this is pre-digital and I am in the process of digitizing the VHS ,VHS-C , 8mm , Super 8mm . and hi 8 tapes and films. Want to see real elephants at The Magic Kingdom? Got it. A disabled monorail being towed backwards to be repaired? Yep. Space Mountain all lit up with people being evacuated during a hurricane? Have that too. I have been going to WDW since their first year of operation (7/4/72). It had been open a little over 9 months. We stayed at The Contemporary with the wave pool in the back. I also have over 10,000 photos much of which , pre 1997 , need to be digitized. Massive project. Another recommendation , if you have them , are Disneyland Line , Disneyland Line Japan , Eyes & Ears , and En Coulisse (Euro Disney). I have complete sets and much can be garnered from them as well as such publications such as WDI (Imagineering) , Eyes & Oars (boat captains newsletter) and others. Each department had its own newsletter – boat captains , monorail operators , bus drivers , food service , etc. I also have most of the Annual Reports. A major source of Disney history can be obtained from cast members. Look for name tags with 10 year , 15 year , 20 year or more pins attached and talk to them. An amazing amount of history is there. Many are delighted to talk about their experiences. One of my favorite sources is a bell hop at The Grand Floridian. He’s been there forever and knows Disney history going back 30 years. Vince, I would love to check out your list and your site! Send me an email with a link.